Cupcake baby shower ideas that are easy and delicious. How can anyone top that? Cupcakes are one of the cutest, and most diverse themes for a baby shower. 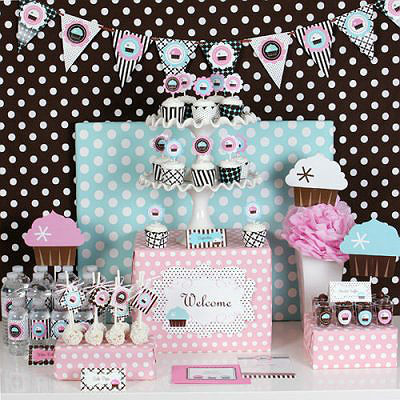 Get inspired to host a party that’s too sweet to be forgotten! Purchase mini-terracotta pots at a local nursery or craft store (check your dollar stores too). Wash and dry pots. Remove any labels or stickers from pots. 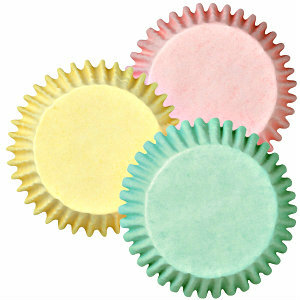 Drop foil cupcake liners into each pot and fill with batter (from the box is fine-and easy). Bake according to directions (plus an extra 5 minutes). Decorate with frosting and flowers (flowers can be edible or otherwise). Little embellishments; buttons, stickers, felt circles, or scrap paper work really well. Layer small cupcake liners over, large liners. Use wire to pierce a hole through the (back-side), center of liners. Bend wire 1/4 inch, add a bead of glue and cover with embellishment or scrap paper. 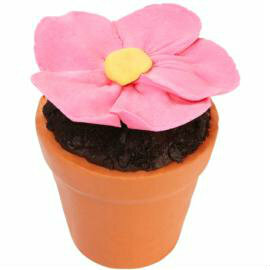 Glue a second, large cupcake liner to the back of the flower (this will cover-up the wire for a cleaner look). Photo and inspiration from Martha Stewart! Baby shower ABC’s! 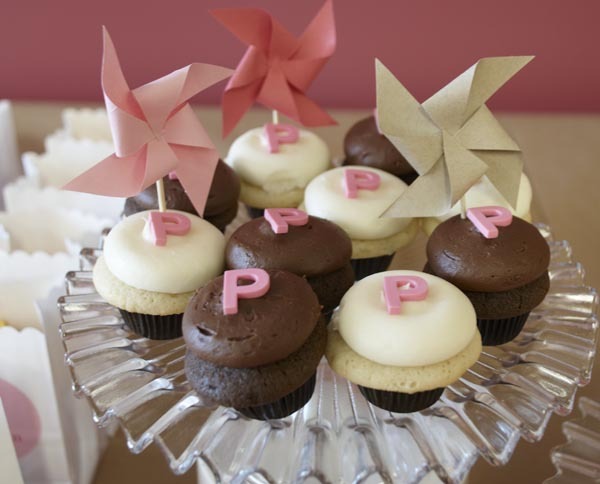 P is for perfect and for paper, and for pinwheel! This technique is from our, associated website at: papersource.com. 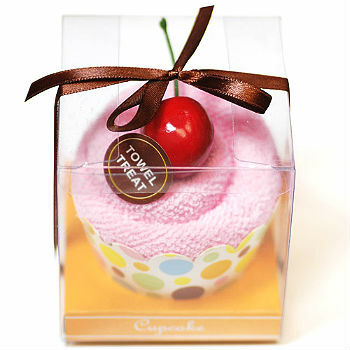 These cute cupcake favors are from Beau-Coup Baby Shower Store; and they are absolutely adorable! This is the perfect way to decorate table tops, gift tables and more. Plus, you’ve got the ideal gift to send home with each guest. Another duel party favor everybody will love is, this everyday household necessity, turned into a creative gift package. Are you thinking about making your own towel treats? They’re not difficult. 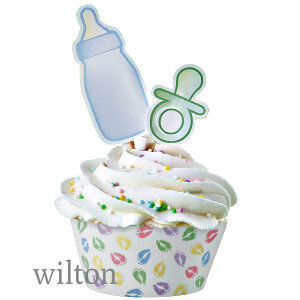 You can even purchase embellishments, paper wrappers, silicone cups and little, cupcake baby shower boxes. You’re going to look like a party-planning pro, by the time you’ve finished. Gift tags can turn a drab idea, into a fab idea. You can customize any label or tag found in our shops. What else can you do? Try this simple idea: Fill glass jars with all the dry ingredients needed for making a batch of homemade cupcakes. You can layer the ingredients for a stunning display- or mix it all together. Quick TIP: Using a funnel to fill your jars; it’s much easier and faster. If you would rather use your talent to make something tasty, that’s easy too. 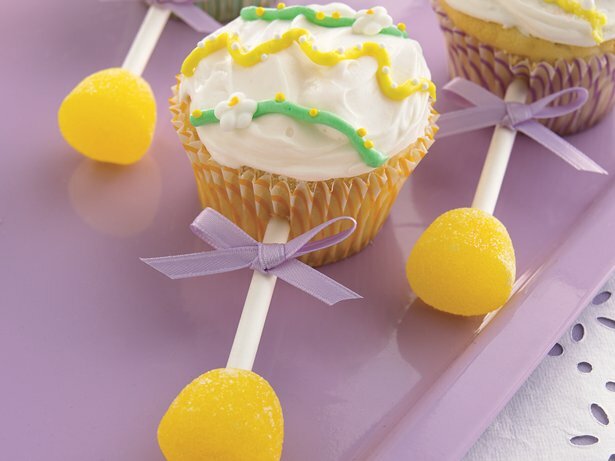 These cupcake rattles from Betty Crocker, will take a little time and patience; but they’re simple to create! Get the, “how to” and the list of what’s needed for this, really fun baby shower idea. The baby shower isn’t complete without one. Cupcake stands are the obvious choice. There are basically two types: disposable and reusable; they can be purchased or easily made at home. One of my favorite ideas is from alittletipsy.com. 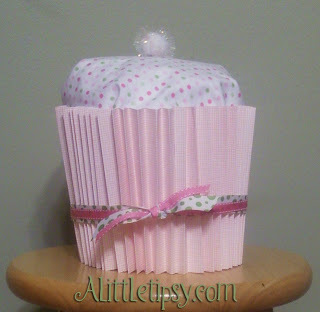 This centerpiece is a cupcake baby shower gift filled with lots of great stuff for a new baby! The contents of the gift are wrapped in a baby blanket, which forms the top of this centerpiece. Go a step further and repeat the process with baby washcloths. 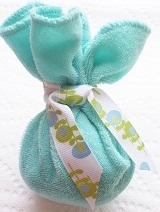 Fill each washcloth with baby socks, tie with ribbon. Place into silicone baking cups with the tied-side-down. Use glue dots, or double sided tape to add a faux cherry on top! If you want to make it into a, cupcake baby shower favor, use adult washcloths filled with bath salts, decorative soaps, candles, or candy. 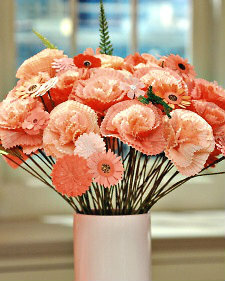 Quick TIP: Double layer tissue paper will work for this idea too. How to make baby rattle cupcakes for a boy or a girls baby shower.